I really think he just has some harmless creases in his eyes, that in time with good humidity may or may not disappear. method successfully with eye-caps that lingered to gently lift them off...but never with "layers of eye-caps", that would best be resolved by an experienced herp vet. remove eye-caps & old un-shed skin, the harder it is. So it's your call. And as far as using "tape": we're not talking about duct (aka "duck") tape here! Omg of course not! Hahaha. No gorilla tape! I’m actually thinking I might try Washi tape. Not sure if you’re familiar with it, it’s basically crafting tape. Not as sticky as scotch, very gentle and paper based. I have hundreds of rolls. I’m a reptile keeper and also a planner. Like my IG account where I take pictures or my planners has over 3,000 followers. Yes that’s a thing hahaha. I may just give it a go tonight, very slowly and gently just to check it out. I’ll give a Luke warm bath tomorrow then let him settle in for a while I think. 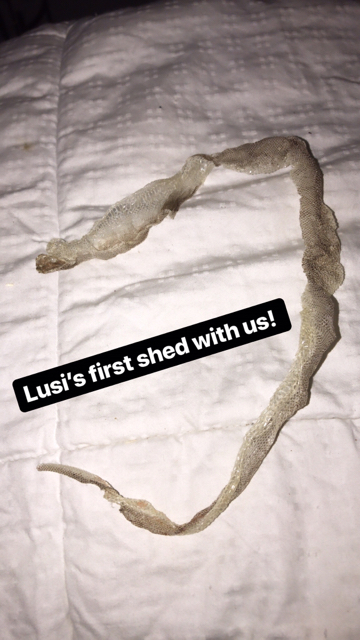 On a separate note, my girl Lusiphera just had her first shed with us! Is it normal to be this proud of a snake? lol. It would have been perfect except when I picked it up I didn’t realize it was still attached I the end of her tail. Whoops! Yes, it's fine to be proud! I'm not seeing eye caps on that snake either. Dehydrated eyes, yes. Caps, no. With caps it's often better to just keep the snake in a super humid and warm environment for a few days and let the snake deal with removing them. 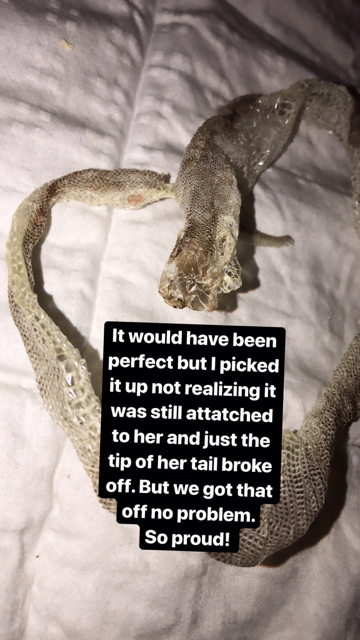 You need to be more concerned with checking the tail tip, as stuck shed there will eventually cut off circulation and cause the snake's tail to become infected. The snake can eventually die from sepsis if it's not caught. may be you could try hydrating him in a tub with luke warm water deep enough to soke him but shallow enough that he doesn't have to swim to stay above water, put some towels in, close the lid (with some air holes) and let him be there for about 15-20 minutes. This helps both with stuck shed and rehydrating the snake. I feel so sorry for him he was with a wrong owner. If you want to keep a live, a good husbandry is a must. Not to mention being afraid of your own pet. I would leave the scotch tape untouched. Supposedly his shed has already dried out and sticks to his skin firmly, it could damage his actual eyes. Imagine you try to pull a dried out contact lens out of your eye, it hurts right?! Last edited by cattleya0507; 03-30-2019 at 03:22 AM. I gave her - had her sexed locally - a bath her second day with us. Just put her in a tub with several inches of water, a towel and a large rock so she could wrap her tail around it and feel secure. Definitely not too much that she had to swim, she was able to rest. She dunked her head under a few times and she felt amazing when I took her out! Like her scales just soaked the water up. I haven’t tried messing with her eyes. The local reptile shop that sexed her for me insisted it was eye caps and not creasing from improper husbandry. I tried to discuss it but was cut off and the woman basically yelled “they’re eye caps!” I want to trust her opinion but she makes it hard. When I asked their opinion about feeder size they said extra small rat. Okay I’ll take one. I asked for one frozen and the same woman shook her head and said “I’ll get you live. Ball pythons don’t eat frozen ever.” Well we all know that’s not totally true. I replied. “Really? All mine do.” She kept pushing me to try live. I told her that I prefer to feed frozen and I would be trying frozen first. I wouldn’t of course starve a snake over my preferences so if it didn’t take frozen I would be back but I wanted to try frozen first. She walked off to help someone else at that point. Sheesh. She did take the frozen rat by the way. I could tell she wanted to. She half heartedly struck once, kept sniffing and flicking it, but wouldn’t take it. I left it under her hide on top of the UTH so it could warm up. Half hour later it was gone. I was really happy especially because she apparently hadn’t been eating with her previous owner. She’s such a doll. We named her Brooksie when we thought she was a male after Brooks Orpik. He might look old and he may be sweet but he’ll still you up if need be so you better show some respect. Just ask Anthony Cirelli! Brooksie still works for a female so we’re sticking with it. It’s becoming a theme anyway. We have a crestie we got with a dropped tail. We named it Big Willy cos he dropped his tail like Wilson drops his gloves! Yes we’re a Caps family lol. Anyway, as for stuck shed on the tail, that’s one of the first things I check. I always imagine stuck shed on the tail is like wearing a ring as a baby and growing up without changing that ring. It just gets tighter and tighter until it cuts off circulation. I keep thinking I see stuck shed on her tail but I can’t get any off so I’m not sure. I’ll get a pic tomorrow and see what y’all think. I don’t wanna bother her since she just ate. Sorry about the short-comings of your local reptile shop. Plenty of wrong information coming from them, & it doesn't sound like they're interested in learning. The owner is really great, I’ve talked to him on the phone and FB before. I just got really unlucky that he wasn’t there when I took her in. Definitely calling ahead from now on though. I do wish we had another place nearby but it’s this place and the chain stores.